Just Scraps is asking us to look in all the magazines we buy for inspiration and CASE a card. I have to do a shameless plug here--since I got published in the April issue of Scrap & Stamp Arts magazine I decided to CASE a shaker card from their March issue, which has a really good article with tips and tricks to shaker cards. In going through some of my stash looking for a template for another challenge I'm working on, I found that I have a Coluzzle Shaker Boxes Template, couldn't have been easier to make this little box. I don't think ProvoCraft makes Coluzzle anymore, so it's a good thing I stocked up when I did. I go between my Coluzzle templates and my Fiskars Shape Cutting templates all the time. 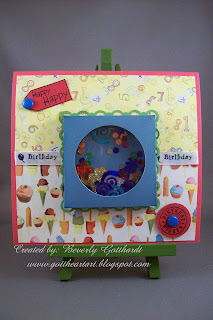 For the Recipe Challenge at ABC Design Blog I used my Stampin Up Scallop Trim border punch, 2 stamps from the Hero Arts set Birthday Messages, and my 3 embellishments are: confetti, ribbon, brads. Supplies: Red Square Card Blank, Papers: Basic Grey 6X6 Cupcake paper pad, rest of papers from scrap stash, piece of clear transparency, Stamps: Hero Arts-Birthday Messages, Ink: Ranger Archival Ink-Jet Black, Stampin Up-Scallop Trim border punch, Coluzzle Shaker Boxes Template, Birthday Confetti-Hobby Lobby, ribbon-Offray, CTMH-blue brads, glue dots. This is PERFECT....... 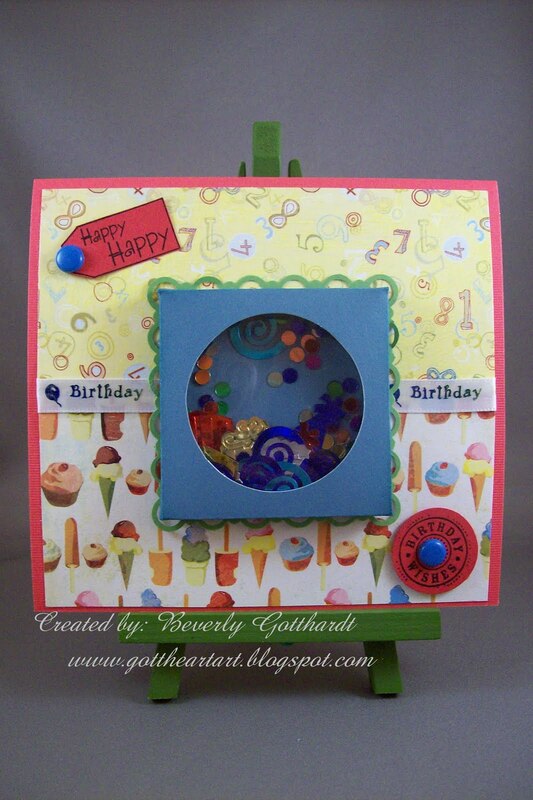 I love the bright colors and that super yummy paper. Anytime you use products that ABC Toys & Crafts sells, let me know. I am always looking for someone to "Spotlight" on our blog. this is amazing Beverly! I never tried a shaker, but this definitely looks fun! great job! Thanks so much for playing along with us @ ABC Toys & Crafts! What a cute project and a lovely birthday card. Good luck and thanks for joining in on the fun at ABC Toy's and Craft Design blog. Ohhhh! I love shaker cards, and this one is no exception. Great interpretation of the challenge at ABC Toys & Crafts!! Thanks so much for playing with us!